Winter is the time to be proactive and start working on next year’s show season shine! There are a few different ways to work towards getting that show ring shine to your horse’s coat, mane and tail. Always begin with a good diet! This means ensuring an adequate amount of good quality hay is being fed, alongside feeding enough fats to help promote the healthy oils in the coat. Your horse’s coat will tell you a lot about the diet you are providing to them. *Most oils are supplemented at a ½ cup daily for a 1,000-pound horse. Also be mindful that adding oils to the horses diet, adds calories to your horses diet. Another popular way to work towards a healthier coat is through spray-on coat conditioners. Such as the feed-thru supplements, these are household items. Walking through a barn you will see a variety in lengths and care of manes and tails. Here are a few tips and tricks to keep your horse’s mane and tail healthy and growing all winter long. If you are able to, shampooing and conditioning your horse’s mane and tail regularly (generally 2-4 times a month is sufficient), will help keep the hair clean and free of growth-inhibiting dirt. Oftentimes trainers and owners will braid long manes, and place tails in a tail bag for protection from the elements. A general rule of thumb is to re-braid manes and tails every 3-4 days to keep the hair clean and strong. The braids should be large enough (2-3 fingers wide) to not break off the hair towards the end, but small enough that the braid does not fall apart by the next day. When braiding tails, start the braid BELOW the tailbone. Very important to not tie the tail bag around the tail bone itself. Adding a feed-thru supplement, or coat conditioner applied to the mane/tail will keep the hair healthy and strong all winter long. 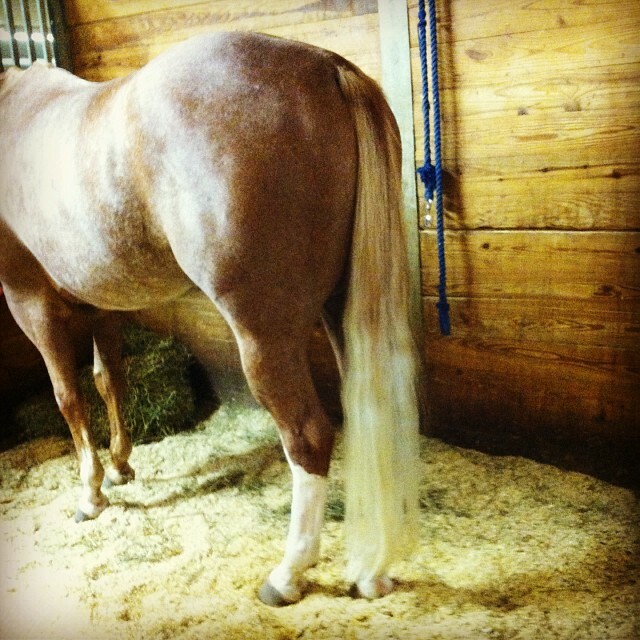 For horses that have a tendency to rub out their manes and tails when stalled through the winter, applying Shapley’s MTG (https://www.smartpakequine.com/pt/pt/shapleys-original-mtg-6238), will help protect the hair shafts and keep the hair from becoming dry and brittle with regular application. All the supplements, and conditioners will mean nothing without some old-fashioned elbow grease. A good-stiff currycomb, and a few minutes every day will help break the winter blues for both you and your horse. If you have any tricks or supplements that have worked wonders for your horses coat, mane or tail, please feel free to leave it in the comments below!